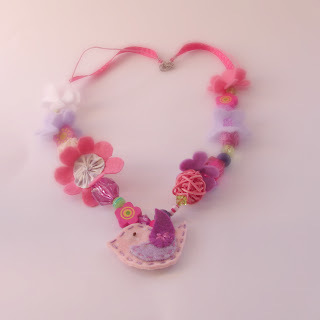 Today I made this pretty little girl necklace. I've been thinking about these types of things for a while and finally got round to making one. I used a pretty pink cord with beads and felt decorations which I made myself. The felt bird pendant is hand sewn and embroidered and all the felt flowers were also hand cut and made. All felt pieces have been hand sewn on and then glued for extra strength. Now that I'm over the mental hurdle of making the first one I'll be onto more!! I'm just waiting for some supplies to arrive and then production will be in full swing! Mmmmmm I think l have seen these somwhere else!!!!! !